This year is the 400th anniversary of William Shakespeare’s death. As part of the festivities—would we call them festivities?—a TV team is taking a peek inside the bard’s final resting place. Much to my embarrassment, I cannot work up one iota of excitement over this. 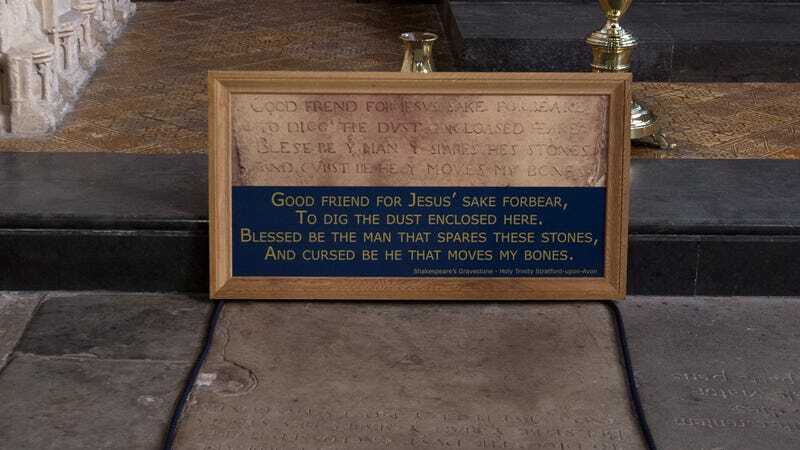 What could possibly be hiding in William Shakespeare’s grave? Educated guess: Spiders, bones, and possibly an ill-advised earring. Come on. Nope, try as I might, still not mustering any National Treasure vibes. Not even if there’s a note tucked inside that says, “’twere Kit Marlowe all along, lol, trolled hard.” Call me when Nefertiti turns up.